Humphrey Bogart‘s screen career followed an offbeat trajectory from villain to antihero to romantic icon, an evolution that underscores the acting craft beneath that familiar persona. This well-crafted profile from A&E’s Biography series brackets that compelling arc by chronicling Bogart’s success in establishing a public image that was genuinely against type, given his origins in a privileged New York family, and his early stage career in roles far removed from the gangsters, gunsels, and blue-collar Everymen that dominated his years toiling on the Warner Bros. Pictures studio lot as a character actor. 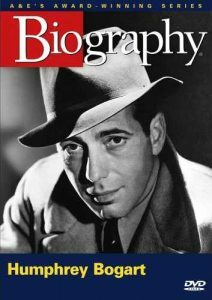 His pivotal late 1930s and early 1940s triumphs, including signature private eyes Sam Spade (in The Maltese Falcon) and Philip Marlowe (The Big Sleep), and the cynical yet ultimately noble Rick Blaine, the world-weary romantic hero of Casablanca, are placed in the context of the actor’s own pilgrimage toward more complex character roles. His fabled romance with model-turned-actress Lauren Bacall, captured onscreen in To Have and Have Not and The Big Sleep, and Bogart’s significance as one of the earliest stars to venture outside studio contracts through his own production company, are also covered, as is his long association with director John Huston. On a lighter note, we glimpse his charter role in forging the original Beverly Hills “rat pack” that would later be associated with Frank Sinatra. He was born on Christmas Day, 1899, to a blue-blood family from Manhattan’s Upper East Side. He made his mark playing some of the toughest tough guys to ever grace the silver screen. Humphrey Bogart created some of the most memorable characters in movie history, a parade of cool loners and tough guys. But it was a long road from his aristocratic upbringing to cinematic success. This in-depth portrait tells his complete story, from his tour of duty in World War I – where he received the scar on his lip that caused his trademark lisp – to his Oscar® winning performance in The African Queen. Biographer Joe Hyams details the trials and turns of his off-screen life, while archival interviews with Bogart himself offer a unique glimpse of the Hollywood legend and clips from his many movies capture some of the greatest moments in movie history. From the child used as the model for “Baby Dimple” in his mother’s children’s books to the man who lit up the screen in Casablanca and The Treasure of the Sierra Madre, this is the ultimate profile of Humphrey Bogart.